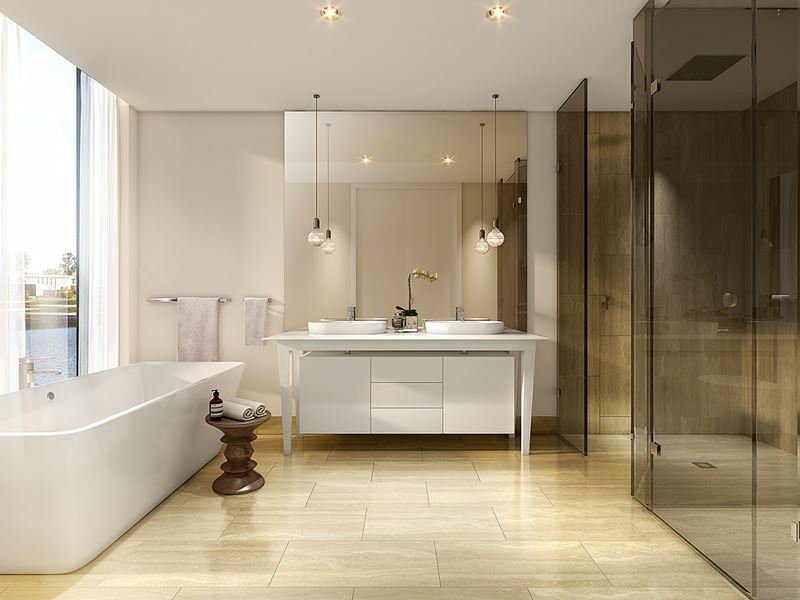 Marina Concourse is the final stage of the Royal Pines Marina and Resort in Benowa. 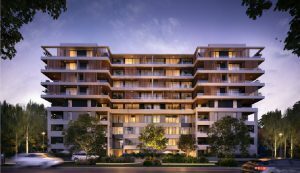 This Gold Coast development is one of Sunland Group’s and includes 110 apartments over two six-storey towers. 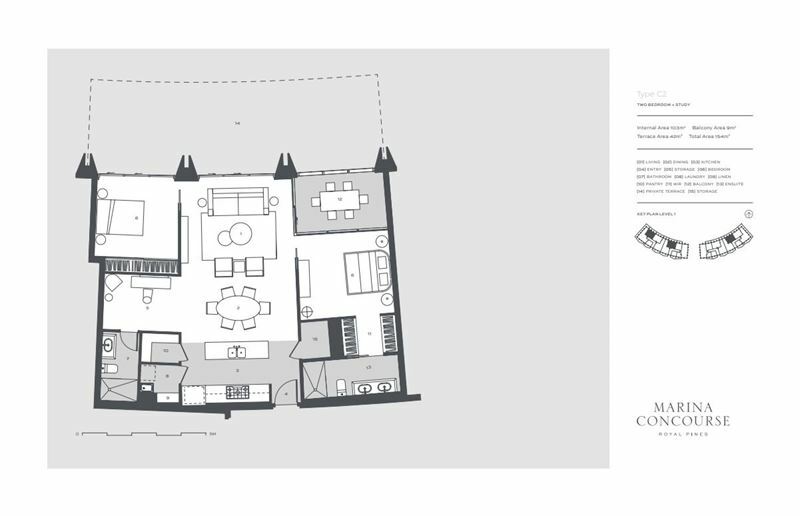 There is a range of two and three-bedroom apartments available, and residents will have access to a number of restaurants, cafes and offices below the apartments (with tenants expected to be announced in early 2019!). Sitting on the marina, across from the Royal Pines Golf Course on one side and Metricon Stadium on the other — Marina Concourse is in the ideal position for those who love their boating, stadium sports, and golf. 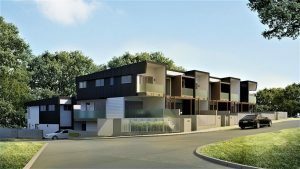 However Benowa is an extremely sought-after suburb for more than that, and Marina Concourse capitalises on the suburbs rising popularity. 110 apartments over two six-storey buildings. 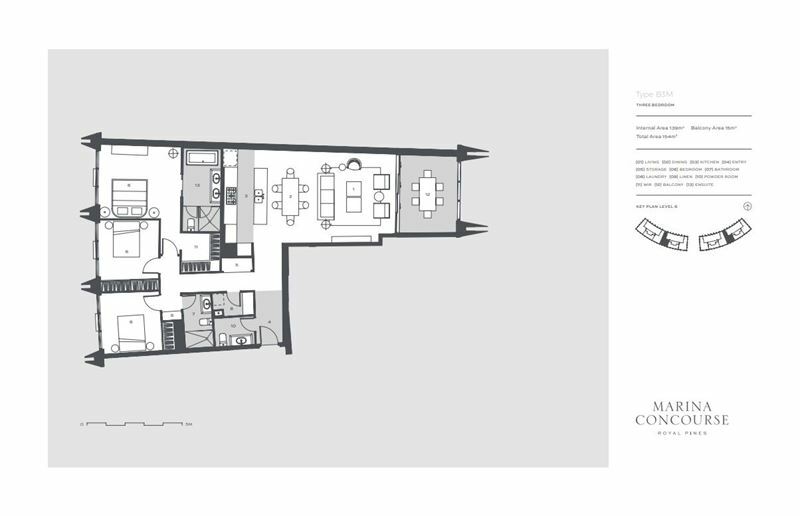 Two and three-bedroom apartment configurations available. Construction has now been completed, which means these apartments are ready to move into now. 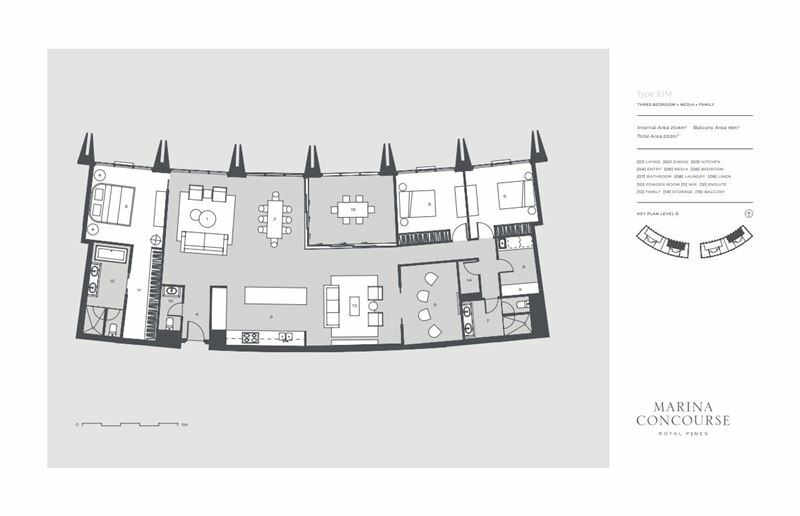 Prices for the remaining apartments start at $690,000. Sitting (almost) on the marina itself, Marina Concourse is the type of development that includes everything, so residents only have to leave when they want to go golfing or visit the beach. There are several restaurants, cafes, offices and a swimming school all on, or around, the ground level of the buildings. Combined with the amenities available for residents, this makes apartments at Marina Concourse ideal for those who enjoy a good work-life balance, or want to live somewhere easygoing, yet close to the busy Gold Coast hub that is Surfers Paradise. The twin towers of Marina Concourse have a very distinctive, aesthetically pleasing design. 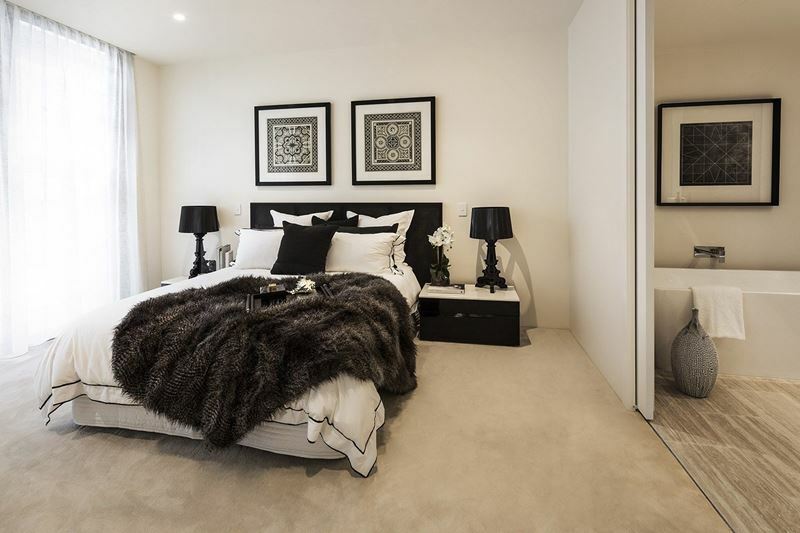 There are 110 two bedroom, two bedroom plus study, three bedroom and three bedroom plus media apartments (plus the penthouses) spread across the two six-storey buildings. 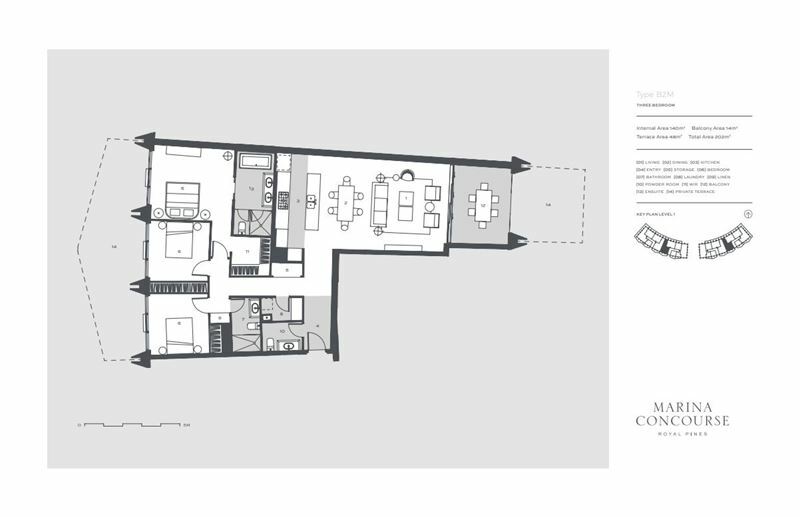 Open-plan living areas, when combined with the floor-to-ceiling windows, make sure that every one of these off-the-plan apartments allows in the maximum amount of light and breezes. Oh, and they’ll help residents enjoy the views to either the Nerang River, Gold Coast Hinterland, or Surfers Paradise skyline, too — depending on which apartment they choose. 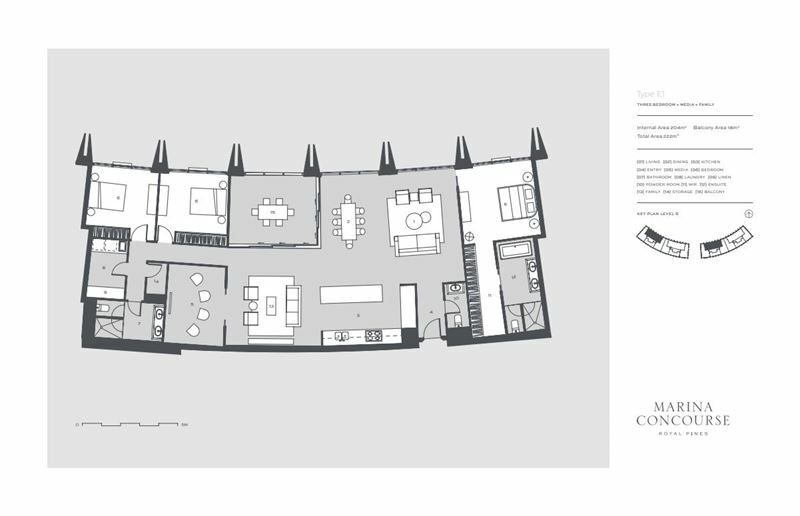 Prices for these new Gold Coast apartments start at $690,000. The location is great for those who want leisure activities they enjoy to be within a few minutes of their apartment. 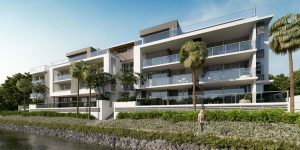 The apartments have floor-to-ceiling windows which will give residents views over the Nerang River, Gold Coast Hinterland or Surfers Paradise skyline. The main road going past Marina Concourse can be congested at times. However, Sunland have assured us that the access and egress roads are safe and easy to use, helping residents keep the flow of traffic moving. 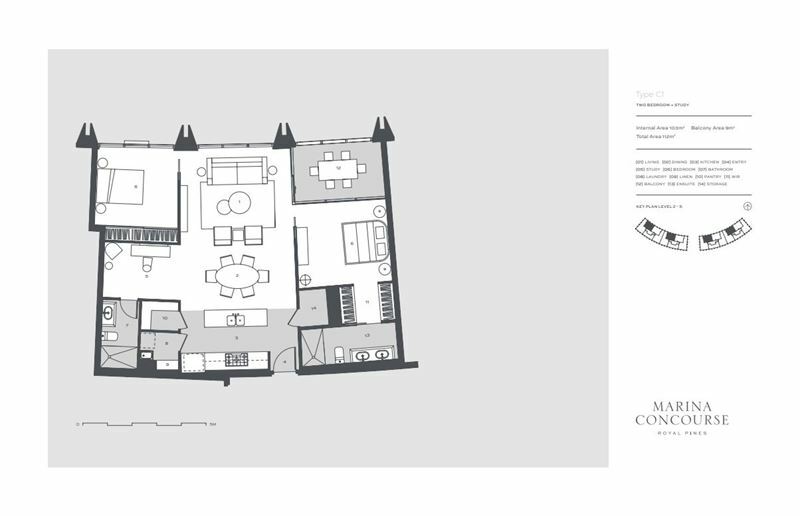 The retail level can be accessed by anyone, which may make it busy at times. Marina Concourse is located in Benowa, just off Ross Street, and across from the Royal Pines Golf Course. 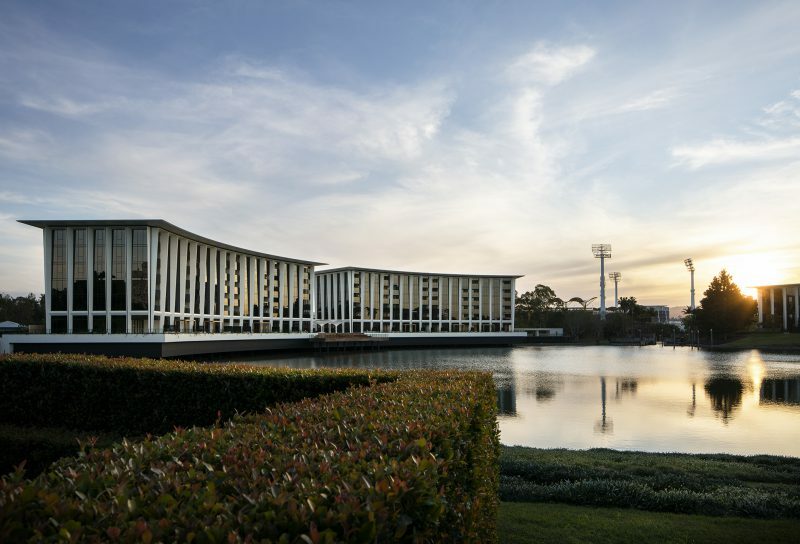 Those who love green spaces will be pleased to note that Metricon Stadium is literally just across Nerang River and the Gold Coast Regional Botanical Gardens are just a four-minute drive away. Future café/dining will be located at the marina level in 2019, providing convenient dining options for residents. However, if you did feel like going a little further, Surfers Paradise is only a 15-minute drive away. There are 12 schools in the six kilometres around Marina Concourse. There is a mix of everything from state schools to independent and Catholic schools, meaning that there is a school for every family. In terms of primary (Prep to Year 6/7), residents can send their children to Ashmore State School, St. Kevin’s Primary School, Guardian Angels Primary School and St. Vincent’s Primary School. 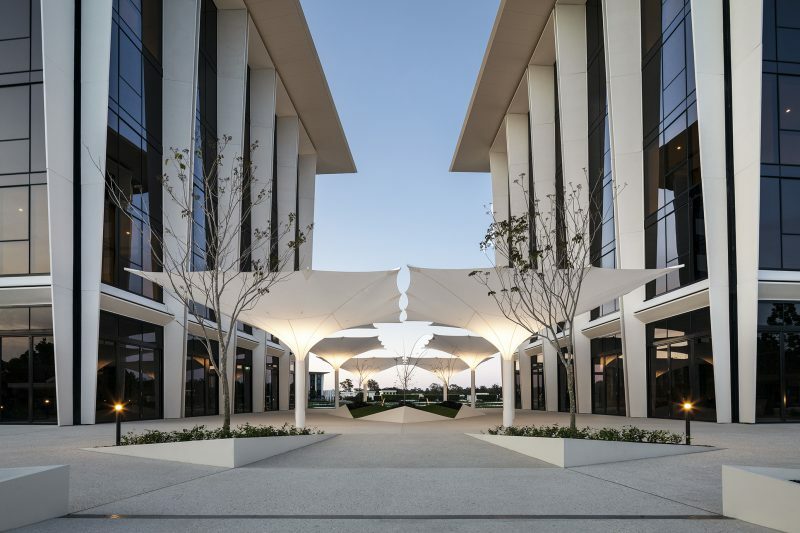 There are only a few high-school-only campuses surrounding Marina Concourse, but they include Benowa State High School, Aquinas Catholic College, and St. Michael’s College. Residents could also send their children to a Prep to Year 12 school, such as Trinity Lutheran College (which is co-education), The Southport School (a boys’-only school better known as TSS), or St. Hilda’s School (the TSS all-female sister school). 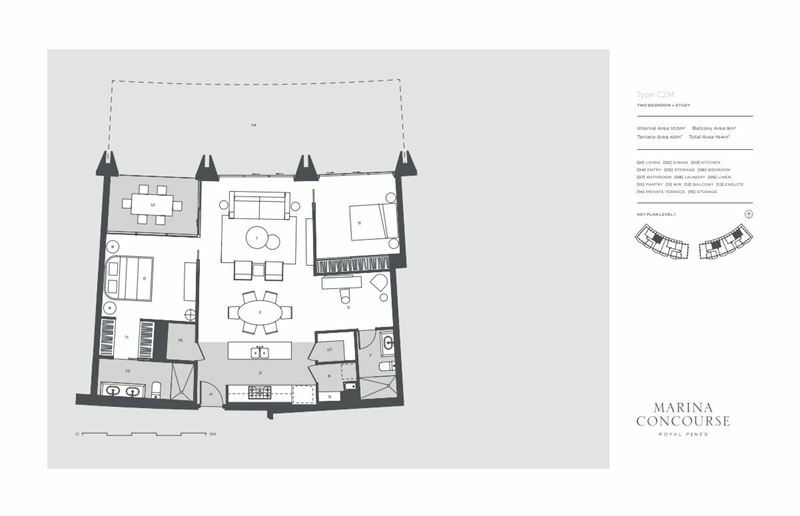 Residents at Marina Concourse have access to a number of amenities, spread over a number of spaces. 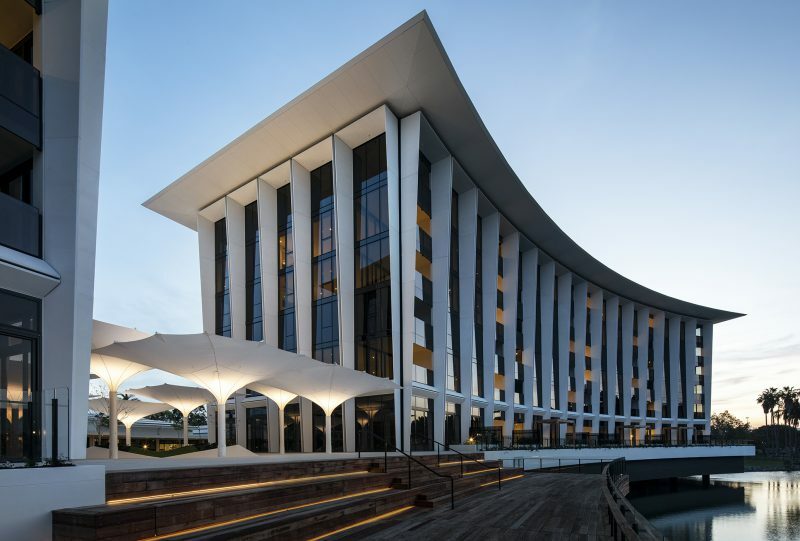 The pool and its adjacent pavilion sit between Marina Concourse and the Nerang River, giving residents views of the river and a private space in this area. 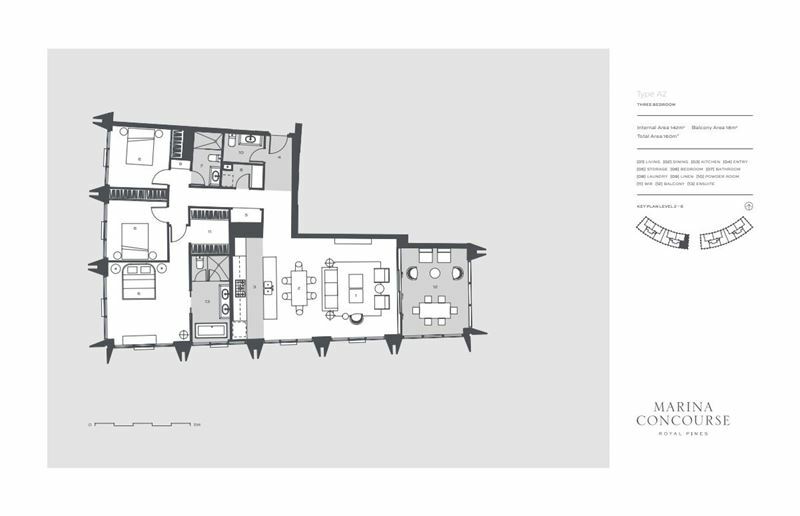 The pavilion includes BBQ facilities and seating to fit residents and family and friends, so it is ideal for entertaining. At the marina level, residents have access to a number of dining and retail stores, along with recreation facilities. 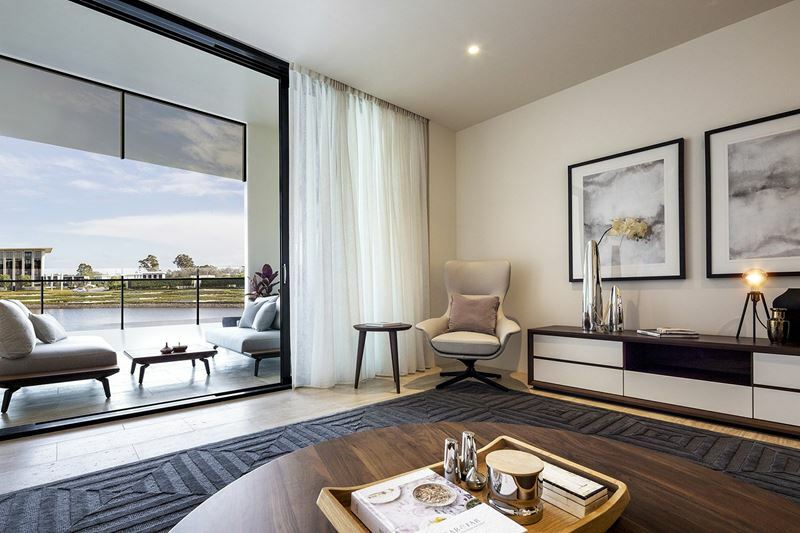 Residents further have access to the Royal Pines Marina, which is two minutes away from the Benowa Village and Benowa Gardens, and the Carrara Super Sports Precinct (which includes Metricon Stadium). The Marina Concourse apartments have now finished construction, so potential buyers can view completed apartments. Use the enquiry form below to make an appointment with Sunland to view a completed apartment. 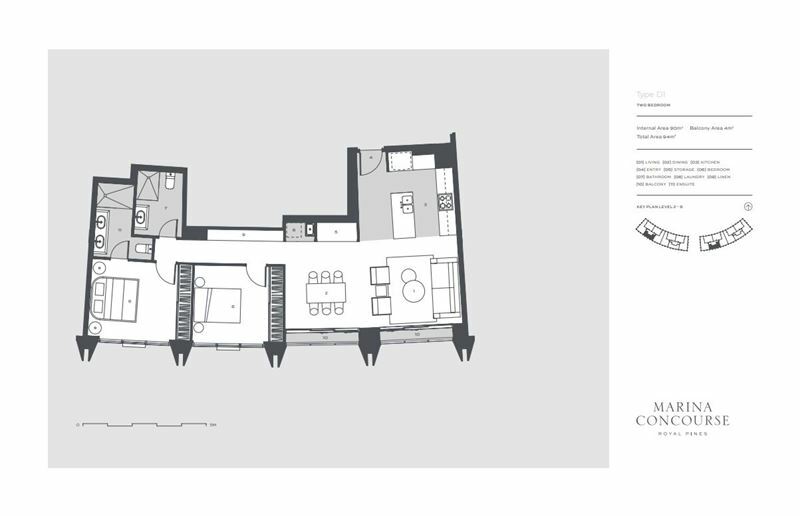 Marina Concourse offers spacious apartments that are designed with owner-occupiers in mind. 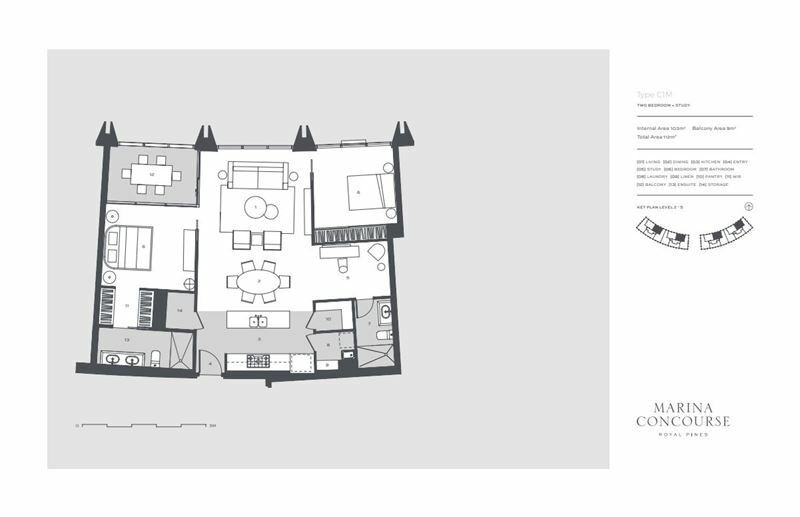 To that end, each apartment — as is evident in the floor plan section below — is laid out in a functional way that will make it easy for residents to use. 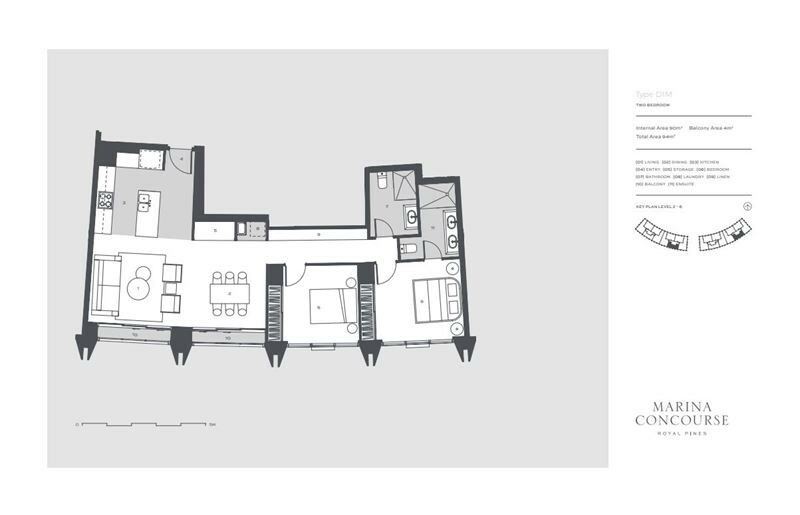 There are 110 apartments in the Marina Concourse development, split across a mix of two bedroom, two bedroom plus study, three bedroom, and three bedroom plus media apartment types. 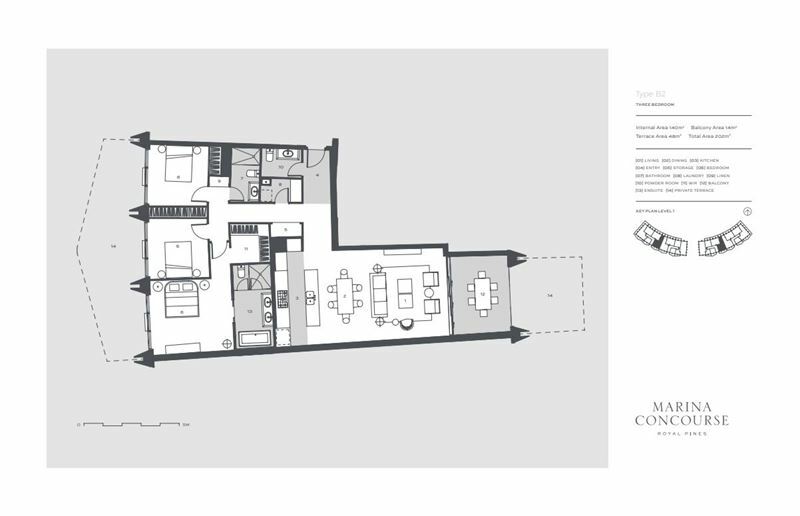 All of them, although undoubtedly similar in layout, maximise the space within the apartments, which is something long-term apartment dwellers will appreciate. 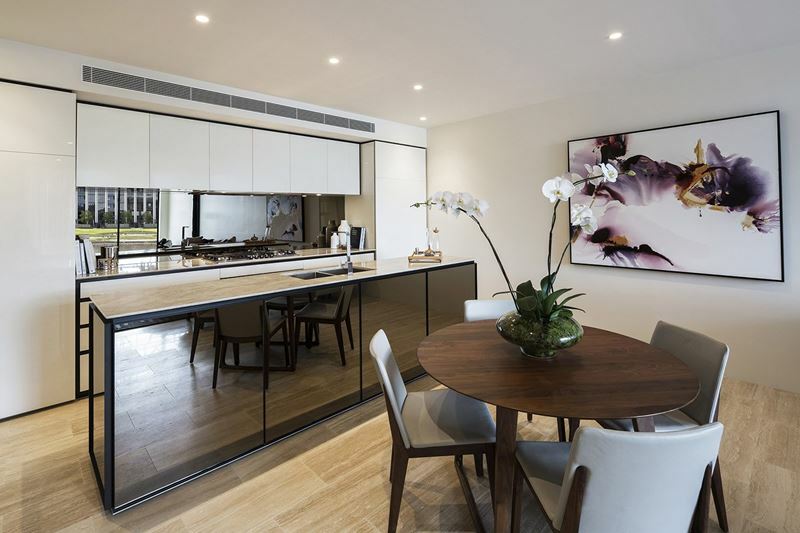 The kitchens and main living areas are the real draws in the apartments, as they, when combined with the floor-to-ceiling windows throughout these areas, make the apartments seem bigger. 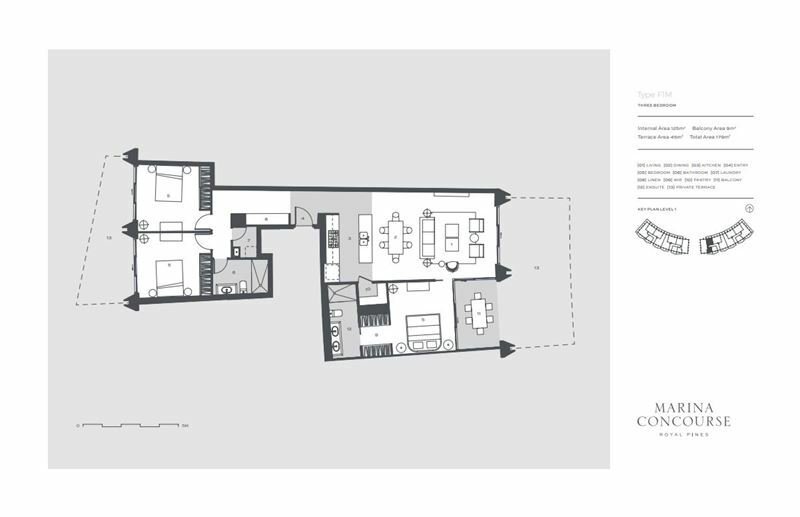 The quality of the design is also evident when you take the conjoining balconies of these spaces into account. 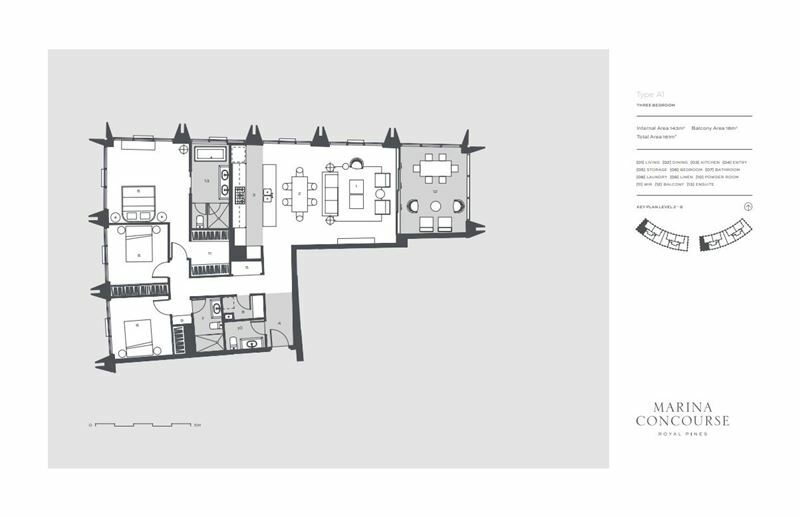 The balconies are designed to be part of the open-plan living area, which is great for residents as it promotes cross breezes through the apartment, and makes this area usable under most circumstances. 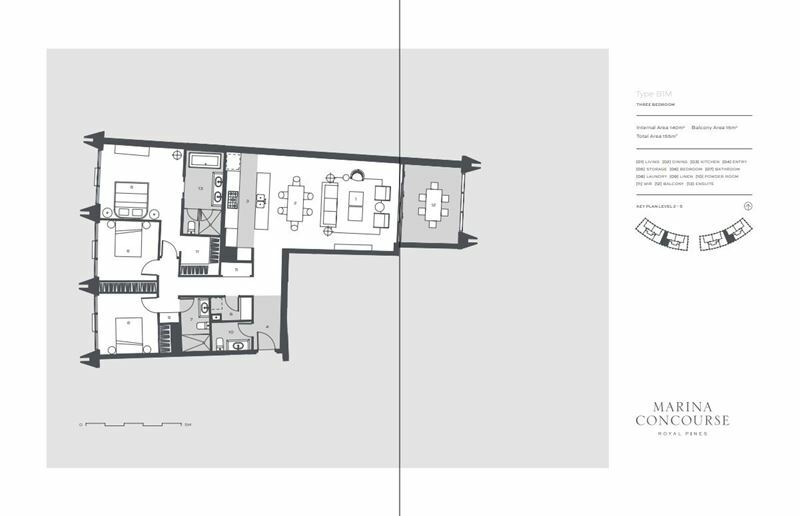 As you can see in the gallery below, there are a number of floor plans throughout the twin-towers of Marina Concourse. Every apartment has its own entry area — which is always a nice touch in an apartment. The air conditioning units aren’t located on the balconies, which is great because it allows you to fully enjoy them, free of noisy condensers, when you have the air conditioning running inside. 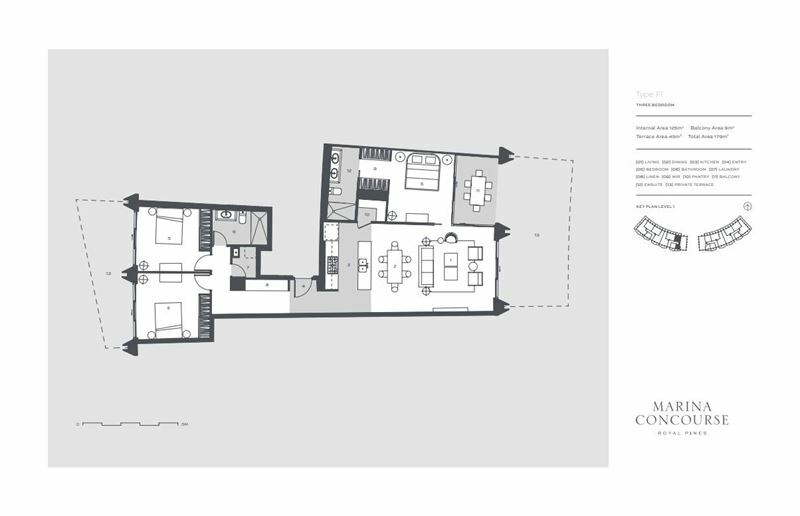 All of the master bedrooms have a walk-in-wardrobe and ensuite bathroom. The apartments all also have their own laundry area (which is conveniently away from main areas). As you’d expect from a Sunland development, Marina Concourse is finished in a way that is functional and aesthetically pleasing. The kitchens, as you can see in the renders below, have stone benchtops, high gloss cabinetry, and an integrated fridge. 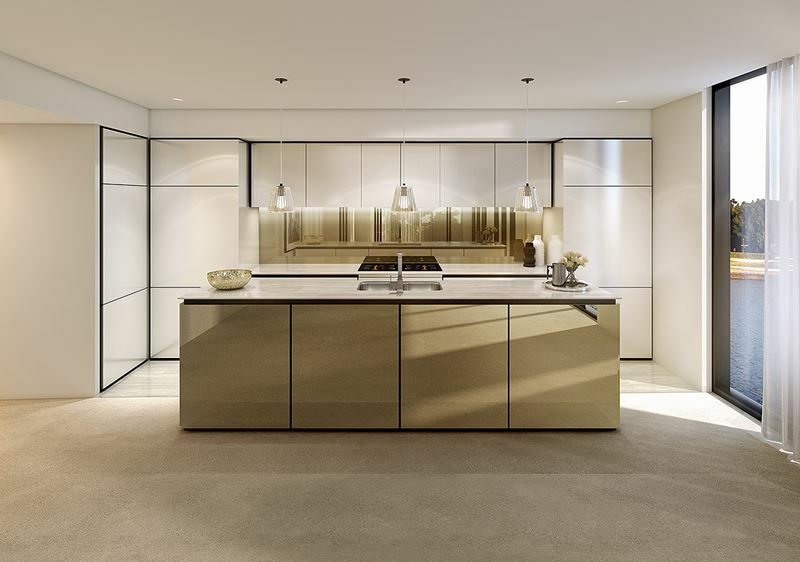 All of the appliances are stainless steel, which, when combined with the bronze mirror splashbacks, make for a striking statement. 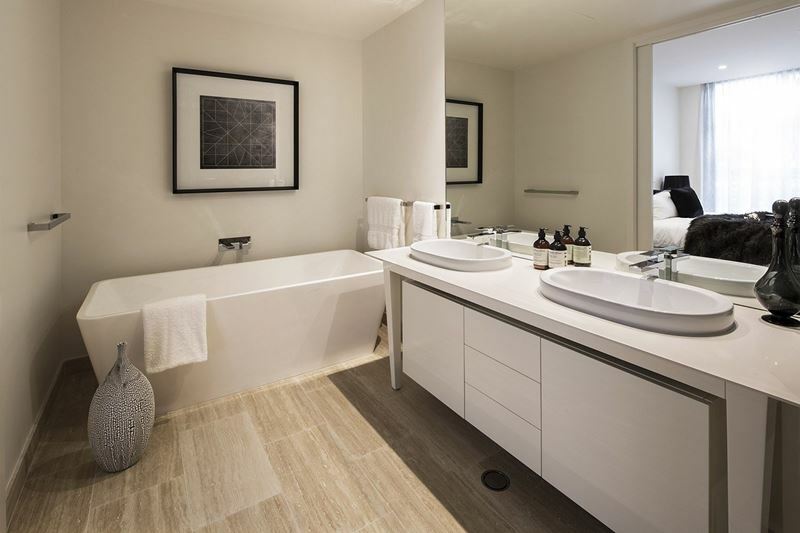 There are LED downlights throughout the apartment, and the custom-designed vanities with stone benchtops in the ensuites and bathrooms are very nice, adding a luxury feeling to these areas. 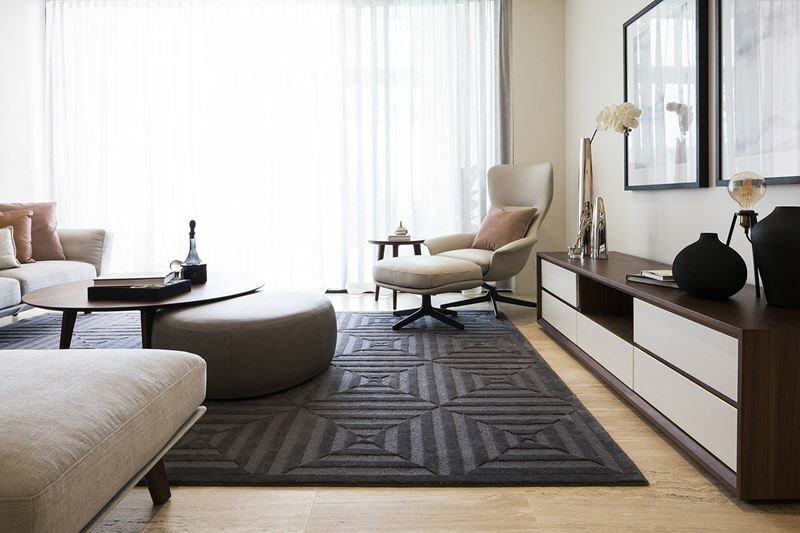 The neutral palette will allow residents to easily incorporate their own personal style. 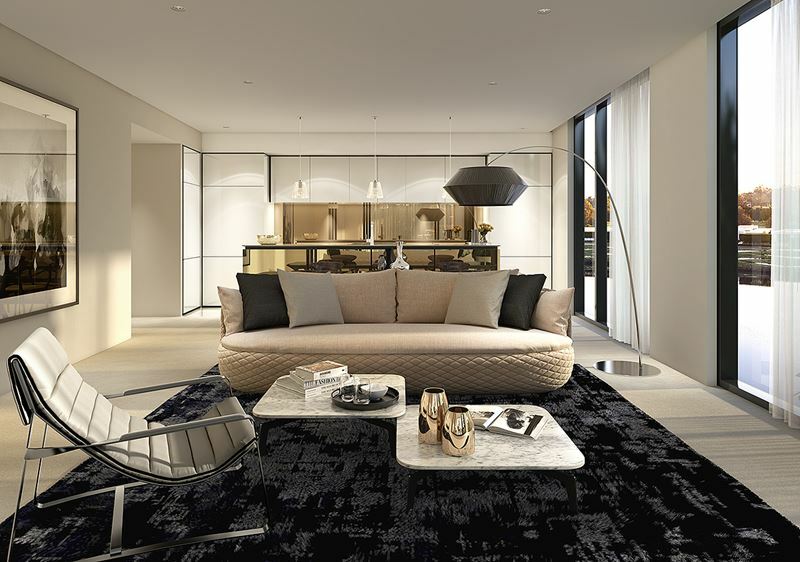 As the photos above show, the finished apartments are almost exactly the same as the renders, which is what buyers are looking for when buying an off-the-plan apartment. 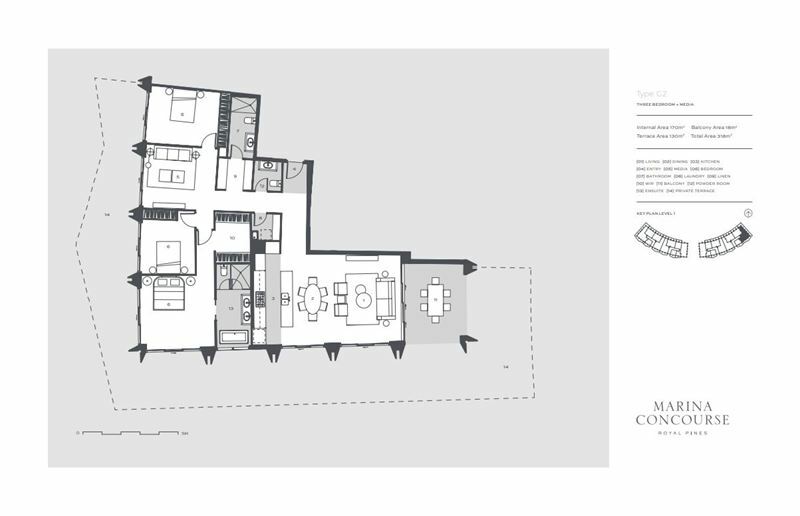 Every new apartment at Marina Concourse has fully ducted air-conditioning, which is a major plus. It’s far more pleasing on the eye, and aircon is a must in the often-humid Queensland climate. Also wonderful for Queensland are the Travertine stone floor tiles. Over the past year, there has been a steady increase in the price of apartments in Benowa, due, we believe, in no small part to the completion of the 2018 Commonwealth Games and the associated infrastructure. The weekly median advertised rent for the suburb is $660 for apartments, which is an average gross rental yield of 6.25%. 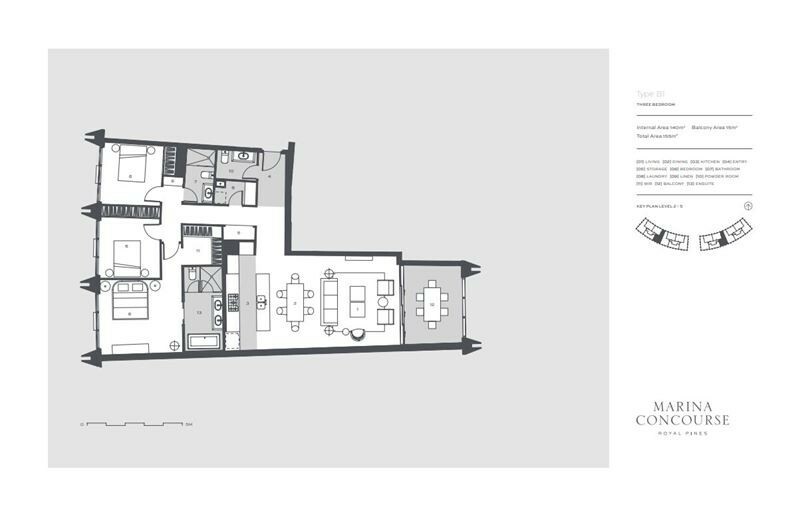 The body corporate fees at Marina Concourse apartments are expected to be around $79 per week. Council rates and water usage are expected to be approximately $2,400 per year or $47 per week. 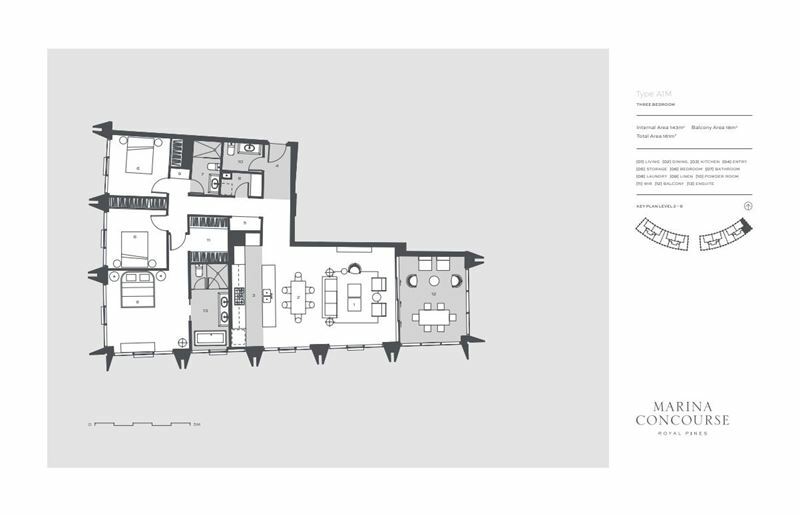 Marina Concourse has been built by Sunland Group, a well-known and respected developer. 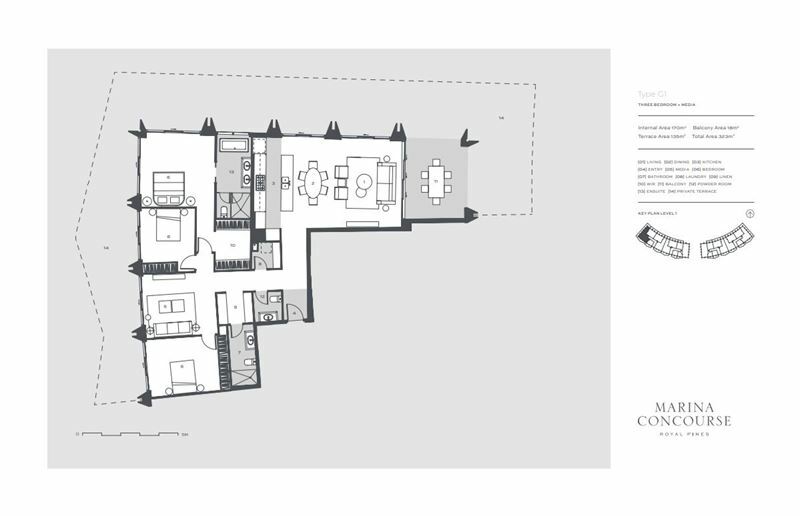 With a focus on using architecture to create inspiring spaces and communities, Sunland Group’s previous projects are instantly recognisable — Q1 and Plazzo Versace come to mind — and are trend-setters for the areas they are in.